I am trying to find out in detail the parts/directions I would need to add a bumper to my Ranger. The only directions I can seem to find anywhere are to remove the old bumper and reverse that process to add new bumper. As you can see from the picture, I am unable to complete the first step. Can someone please advise of the Step by Step in depth process for adding a bumper on to what I am working with or where I could find such information? Including parts and tools needed would be a big help. Please let me know if additional signature information or pictures are needed. Thanks! Your best bet would be to go to a local u pull junk yard. 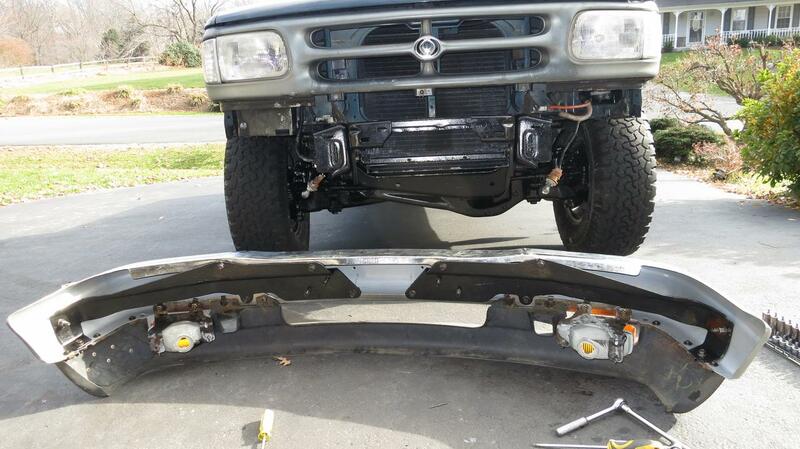 Remove a bumper from a ranger. Then reverse that and put it on yours. That way you make sure to get all the parts. Trying to peace it together would be tough. And probably more expensive. Cannot give you step by step, but here's,an exploded view and a parts list. 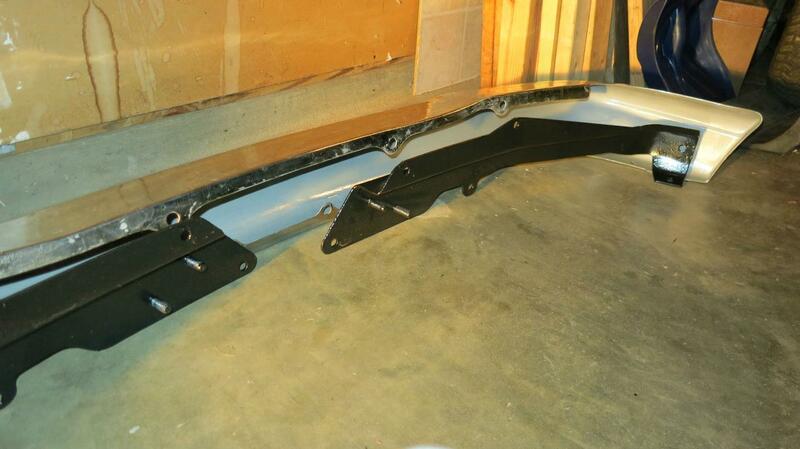 Step 1: Bolt on the short L-shaped bumper bracket (1 per side) using 2 bolts each. They adjust the height and tilt (fwd/bwd) of bumper. Step 2: Install the 2 long bumper brackets into back side of bumper using a dozen or so flared bolts fastened into speed-nuts (U-nuts) that clip onto the bumper. The only "special" bolt is the 1 chrome plated carriage-bolt at each end, which installs from the bumper's outside face. CAREFUL: check for twisting BEFORE & AFTER you tighten these brackets to the chrome bumper, cuz the thin bumper tends to flex/twist, which is not noticed until you mount it to body. Step 3: Install the optional plastic valance, which (in my case) holds turn signals. The valance bolts to the bottom lip of the bumper, not to the bumper brackets. Again, bolts with U-nuts. Also, attach the optional plastic license-plate holder. Step 4: Attach it to vehicle. That means long brackets attach to short brackets. It attaches only by the 4 studs, nothing else, so use flat washer & tighten each of the 4 nuts. The studs on those long bumper brackets insert into the slotted holes on the short L-shaped brackets. These studs allow side-to-side adjustment, to align bumper to body. See that 1 "special" chrome plated bolt on this end of bumper? Last edited by cvar; 02-17-2014 at 12:15 PM. Thanks for the diagram and pictures they are real helpful! I'll see what the local U Pull and save has available. Hopefully I can find everything in the diagram and follow your pictures to install. Can anyone identify what the square metal piece is in my picture? Was it just something that was added to give some protection to the front? Thanks again! Your 1996 should exactly match my 1997. Some helpful photos are at the bottom of my photo album at ( http://imgur.com/a/CKVUo ) <== CLICK Step 1: Bolt on the short L-shaped bumper bracket (1 per side) using 2 bolts each. They adjust the height and tilt (fwd/bwd) of bumper. Step 2: Install the 2 long bumper brackets into back side of bumper using a dozen or so flared bolts fastened into speed-nuts (U-nuts) that clip onto the bumper. The only "special" bolt is the 1 chrome plated carriage-bolt at each end, which installs from the bumper's outside face. Step 3: Install the optional valance, which (in my case) holds turn signals. The valance bolts to the bottom lip of the bumper, not to the bumper brackets. Step 4: Attach it to vehicle. The studs on those long bumper brackets insert into the slotted holes on the short L-shaped brackets. These studs allow side-to-side adjustment, to align bumper to body. See that 1 chrome plated bolt on this end of bumper? Where did you get your bumper? My b2300 has black pads on the top of the bumper and yours doesn't. I think that square is just a piece they threw on it. Casey, an ebay vendor ( http://stores.ebay.com/carpartswholesale ) sold 'em, in 2011. No slots for any clip-on plastic/rubber stuff. Yay! So I tossed the plastic pads. I prefer the all-chrome look. This was only 1 of many after-market bumper choices available. 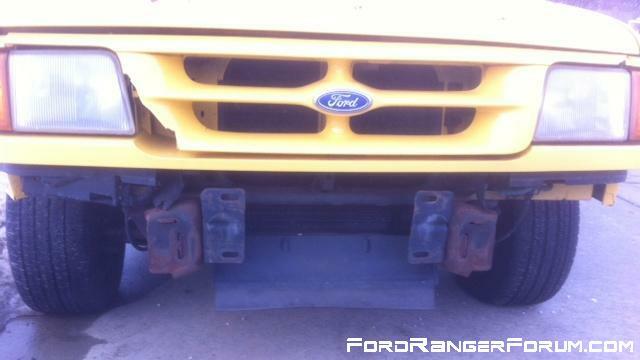 Ole_Yeller_96, your steel plate is not from Ford. It looks like a sheet of ordinary scrap metal your PO probably had in his shop. He was likely trying to imitate the Prerunner look. Thanks, I'll see what I can find on CL. Thanks again cvar! This explains why I couldn't find anything about it! Craigslist and Junkyard were a bust. I am just going to buy online. I took the metal piece off and this is what I am dealing with. I've been trying to find an all in one kit (including nuts, bots etc.) and this is what I found. 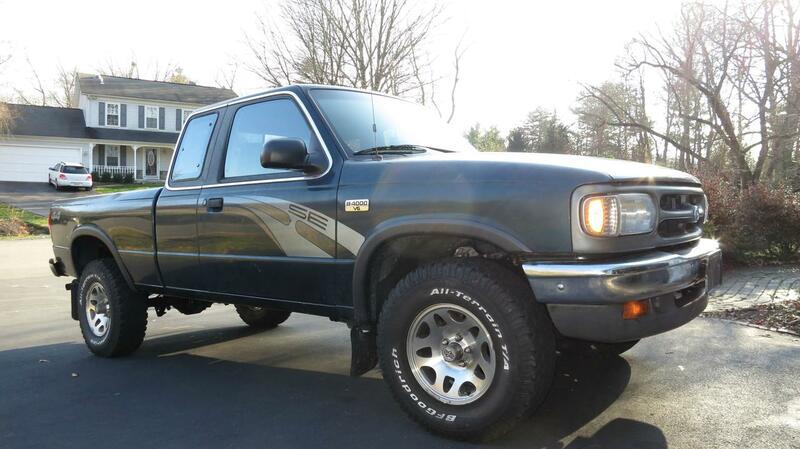 It says its fit for my Ranger, but I was wondering if anyone had any thoughts on it? It seems a little too gimmicky to me. Thought it looked kind of cool at first, but the side views changed my mind. This may also help you find new parts and lower cost. 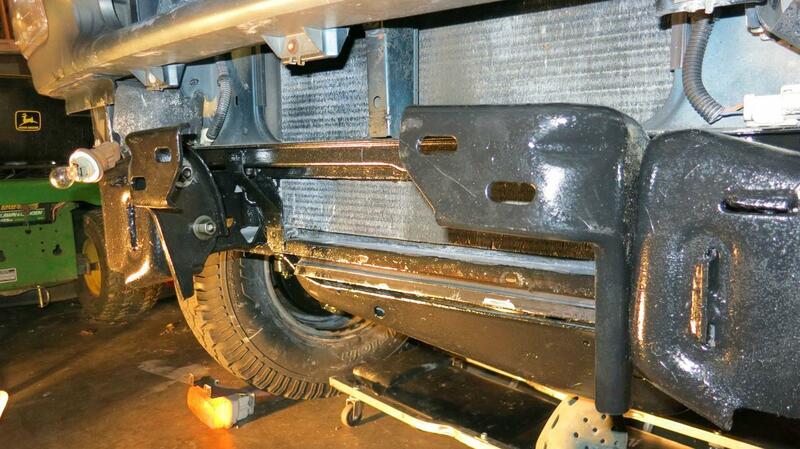 Those inner brackets of yours are gonna interfere with the stock bumper brackets. Are they removable? Hopefully not welded on. 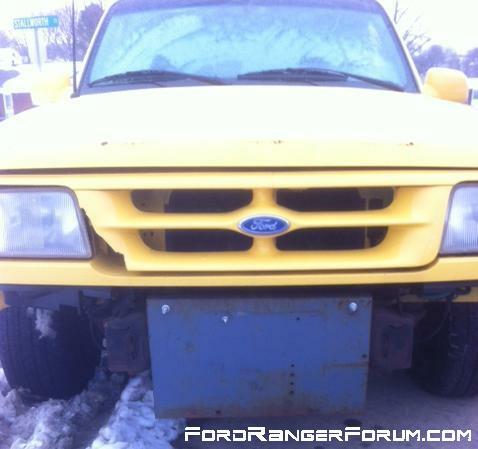 Looks like you could use a new yellow grille too, cuz yours is broken. Where are your turn signals mounted? I don't see any? Have you converted your corners into turn signals? My corners do not blink, but there's an easy (wiring) mod that can transform them into turn signals. The inner brackets are not welded. I didn't know they weren't suppose to be there I can remove them. The corners do act as turn signals so that's one plus. Not worried about the grille at the moment since that seems like an easy fix. More concerned about all the parts needed to put the bumper on. I'll use the LMCTruckdiagram and buy all the parts needed. EWWW don't put that bumper on it! You just need to wait for someone in your area to "part-out" their ranger. Craigslist ("auto-parts" section) often has those. And so do FRF members, from time to time.